To my amazement, our apple tree is already producing apples. 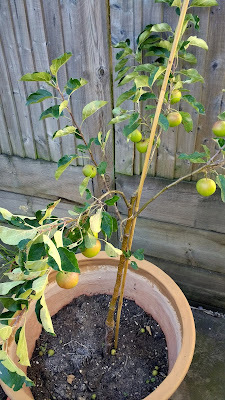 I'm sure it wasn't meant to for another 2 years (we planted it at the end of last year), but the current fruit is a precursor to the apples it will produce in time. We have a 'Scrumptious' tree and it should produce red, sweet-crisp apples of a moderate size. These initial fruit are green, tart and small - not so good for eating plain, but perfect for baking with. I have lots of apple baking recipes already but still like to experiment with new ones. I made this slice after a day out and about with my parents, and wanted something that would come together in a single bowl with no electric beating necessary. Consequently, this is an easy recipe to make. I used banana as an egg alternative (rather than chia seeds or similar) and think that gave added moisture to the slice, which is soft and chewy under a crisper top. With the sweet, almost caramelised apple pieces, it really did feel like pudding in slice form. You can't taste the banana (I know some people aren't a fan of banana baked goods) and the slice doesn't need any accompaniment, but I imagine it would be delicious served warm with ice cream in winter. We're having a bit of a heat wave at the moment (30'C here today!) so we enjoyed it cold. This got ticks of approval from my parents and Mr Bite and I expect to make it again - possibly with some more of our home-grown apples. Pre-heat your oven to 175'C (350'F) and prepare a square baking dish. In a large mixing bowl, beat the banana with a fork and then whisk together with the oil, milk and vanilla. Add the sugar, flour, spice, bicarbonate of soda and salt and stir well with a wooden spoon to combine. Stir in the sultanas / raisins and chopped apple. Transfer the batter to your prepared tin and bake for 35-40 minutes, until the top is golden and crispy. Allow to cool fully in the pan before cutting. Have you grown apples - and if so, do you have any advice for apple tree care? Wow, congratulations on the home grown produce! I'm always so surprised by the fruit that my spindly little fruit trees produce. Home grown goodies always bring something special to cooking. Your slice sounds delicious. Thanks Lisa, and you're right, home grown goodies have an extra excitement to them! I've always associated apple trees with cooler climates so am not sure if they like the warmth - and prior to the last month or so they have mostly had winter/early spring weather, so I'm not sure if the recent heat has played a role. I would predict them to do quite well in Melbourne if planted at the right time of year but would definitely defer to others with more expert knowledge! I am so jealous that you have apples in your garden - that is something that I really wish we had space for. Apple desserts are my favourite, so this looks great to me. How wonderful that you are growing your own apples. I am always chuffed when I use my own herbs, so using your own apples must be fun. Thanks Cakelaw, it really is! Oh your tree is so cute! That's awesome that it's producing fruit already. I love the idea of harvesting fruit from your own yard to make wonderful dishes like this. Yum!